Providing a vibrant outdoor program for your unit isn’t easy. Experience the solution at Texas Powder Horn where we help you deliver on the promise of Scouting: Adventure! At Texas Powder Horn, you “learn by doing” as you try each activity first-hand so you know how much fun your unit can have. You’ll have fun outside learning from experts on how to arrange equipment, facilities, guides, instructors, and other aspects of outdoor fun for your unit. 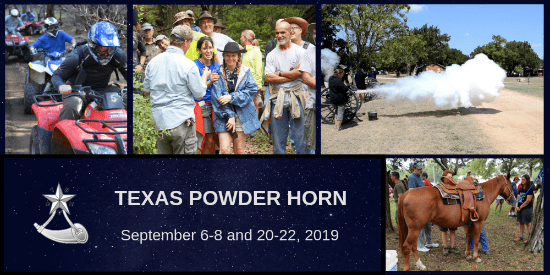 You will leave Texas Powder Horn with exciting memories, an increased network of contacts and resources, implementation ideas, and access to activity-specific online communities to help “Bring the Adventure Home” to your unit. Capitol Area Council and Longhorn Council sponsor this acclaimed training opportunity by bringing together a diverse team of experienced Scouters and experts from all over Texas to guide you through the adventure at Longhorn Council’s beautiful Camp Tahuaya, just south of Belton, Texas. Powder Horn is for Cub Scout, Scouts BSA, Venturing, and Sea Scout Leaders and older youth leaders! Powder Horn is open to all registered adult and youth leaders. Youth must be 14 or older (or 13 and have completed eighth grade, if a member of a venturing crew). See all qualification requirements below. What will I learn at Powder Horn? Note: Powder Horn is “challenge by choice”; this means no one has to participate in any activity which he or she may feel uncomfortable doing. Two 3-Day Weekends from Friday through Sunday afternoon at Camp Tahuaya. Enrollment for this course is limited to the first 48 fully paid participants. Fee includes all meals, training materials and supplies. Refund policy is available HERE. Total Price – $250 is due upon early registration. Registrations after July 1 are $300. Adults must have completed youth protection and training for their position. Youth age 14 or older (or 13 and have completed eighth grade, if a member of a Venturing Crew) must submit a recommendation from their Advisor/Scoutmaster to the Course Director for approval. Youth must also have completed the unit leadership training for their unit (Introduction to Leadership Skills for Troops (ILST) / Crews (ILSC) / Ships (ILSS)). Meet BSA physical requirements. Bring a current BSA Annual Health and Medical Record (parts A, B, C) that is good through the last day of the course. Register early to secure your spot – Spaces are limited and filling quickly!